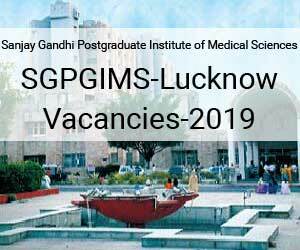 New Delhi: The Sanjay Gandhi Postgraduate Institute of Medical Sciences (SGPGIMS), Lucknow has released 15 vacancies for Senior Resident on Contractual Basis.The Selection will be done on the basis of Walk-in-interview. Applications are invited for vacant posts of Senior Resident in the following departments for a Short-Term appointment for a period of 89 days. The SGPGI caters to emergencies relating to the specialties existing at the Institute. The SGPGI is situated to the Southeast of Lucknow city on Lucknow-Raebareli Road. It is situated nearly 12 Km from the main (Charbagh) railway station and 15 Km from the city center (Hazratganj). From the railway station, private buses (route 3) run to the Institute at short intervals. WALK-IN-INTERVIEW ON TUESDAY 9th April 2019. Number of posts may be increased or decreased. The Vacancies are in the Department of Emergency Medicine. MD (Anaesthesiology/Internal Medicine/Emergency Medicine/Surgery/Orthopedics) & Experience- As per under Govt. rules. 33 Years as on 1.1.2019. Candidates who have already completed three years Senior Residency may not be considered for the appointment. a. A bank draft of Rs. 200/- (rupees two hundred only) in favour of ‘Director, SGPGI, Academic Account’ payable at SBI, SGPGI Branch, Lucknow. b. One recent passport size photograph. c. Xerox copies of all relevant Certificates and Testimonials. Candidate should fill the prescribed form available before the interview.